Standardized (and shrinking) airline seats have made it difficult for people of all shapes and sizes to fit into an occupied space with set dimensions, because not everybody can fit comfortably. However, not all airline seats are created equal. With the revolution of Premium Economy or Economy Plus cabins, you can have a little extra legroom compared to Basic Economy…if you’re willing to pay for it. Just how much extra room do you get, though? Is there a way to compare and contrast flights with different amounts of legroom? Once again, the Google empire saves the day. 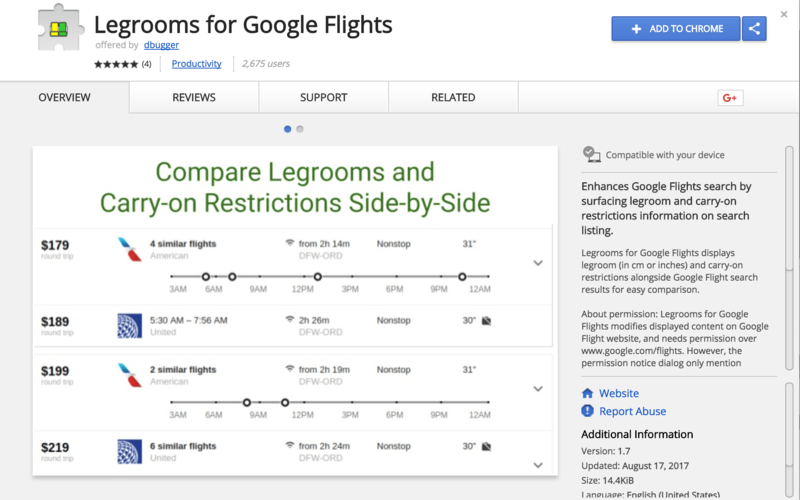 A Google Chrome extension called Legrooms was developed in order to allow you to compare the aspects about flying that you really care about once you board, such as seat pitch and allowances for carry on luggage. As a person who doesn’t in the airline industry, you may not be familiar with the term “seat pitch” so let’s go over what that means. Seat pitch is the measurement between the back of your seat and the back of the seat in front of you, including the tray table and seat curvature. As you may have guessed, a few extra inches of seat pitch can make a world of difference! The Legrooms extension works with Google Flights search results in order to provide extra information while you compare potential flights. So, let’s go through what Google Flights results look like when Legrooms is enabled. For the sake of argument, let’s say I want to look at flights between Nashville and Houston. Google Flights itself will list the domestic carriers who fly that route on my selected dates, highlighting the cheapest one. However, now that Legrooms is enabled, there is an extra column on the right end of the search results that lists the seat pitch for each flight. 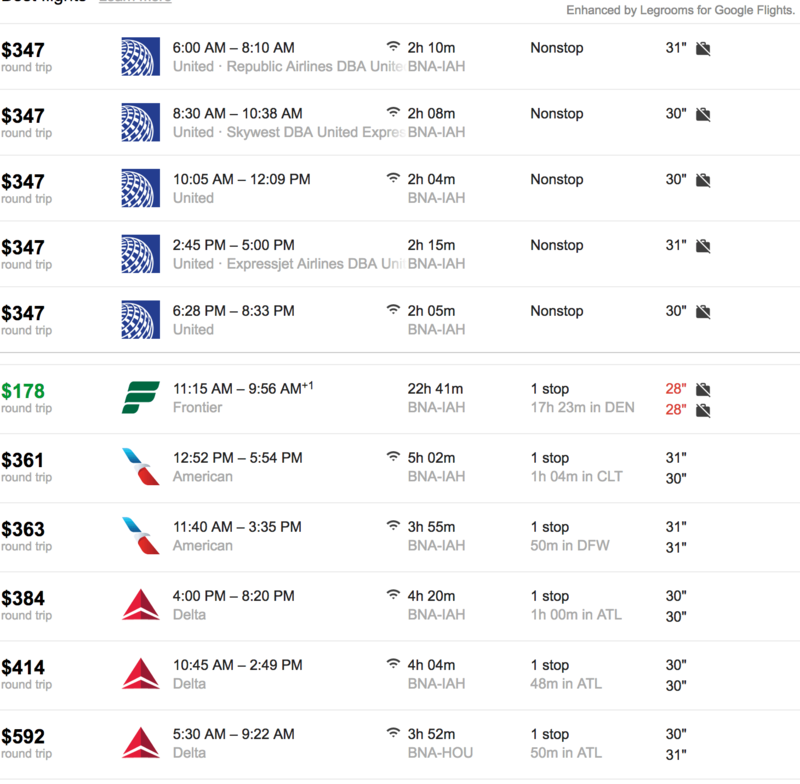 Unsurprisingly, the cheapest flight (with Frontier, in this case) is the flight with the least pitch. Most travelers would agree that 28 inches of pitch is a cruel and inhumane way to travel, and unless you are a very small person with a very small budget, it is well worth it to take a flight with at least 30 inches of pitch. 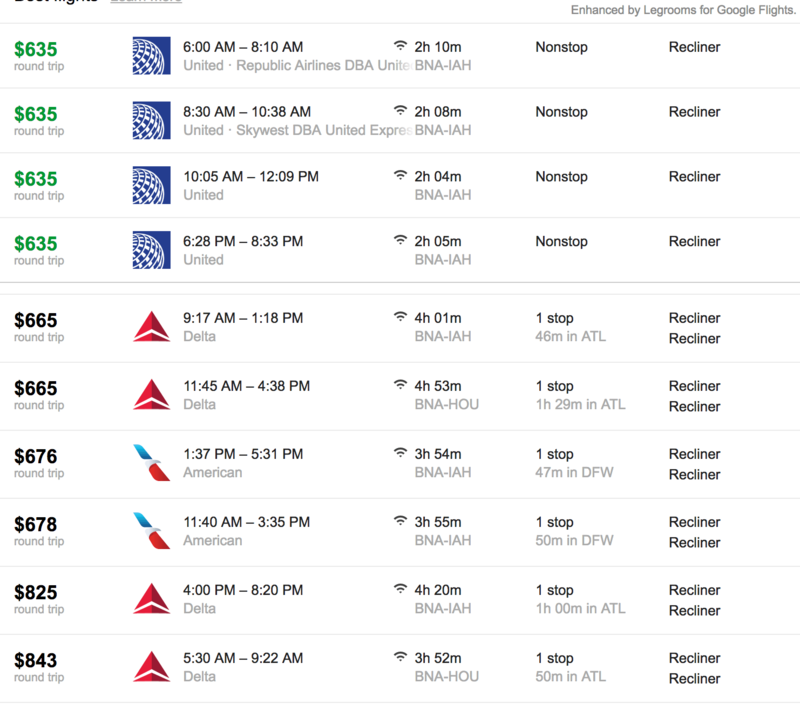 The default setting is a search for economy flights, but if you’re looking for a higher class, Google Flights is equipped to run that search as well. Starting with business class flights, Legrooms will report the type of recline instead of reporting on a pitch distance. For example, the seats may only recline or they may lay nearly flat; with the Legrooms extension, you will never have to guess. Applying the Legrooms extension to your Google Chrome browser is an easy thing to do, and can save you loads of guess work. If you don’t have Google Chrome, you can download the browser here. Then, simply visit the Legrooms extension page here and click on the “Add to Chrome” button. Once Legrooms downloads, an icon for the extension will appear in the upper right hand corner of your browser. The icon looks like two grey seats and is available for you to click if you wish to go directly to Google Flights and start using the extension. However, Legrooms will already apply itself to any flight search that you run using Google Flights. Simply visit the Google Flights page and enter the parameters of your flight search, and Legrooms will automatically provide you with pitch information. Some other apps exist in order to help you compare seats across airlines; Seat Guru is one of those apps. Seat Guru will compare legroom statistics across airlines for all general flights, based on whether you choose Economy or First/Business class. Note that there may be a difference between short-haul and long-haul flights, and Seat Guru will take this into account. The search results show a generalized chart organized by airline, which you will then sort through yourself in order to find specifications for a specific airline. However, you cannot enter specific flight details in order to find pitch measurements for a certain flight. While there are several apps and platforms that aim to make your flying experience more comfortable, Legrooms is convenient especially if you use Google Flights as a search platform. If you have long legs, or even if you don’t, it is important to know how much space you will have during a flight. However, it can be difficult to gauge exactly how much space is provided if it isn’t explicitly noted before you book. With Legrooms, you are able to take all of the guesswork out of the booking process and will be left with no unpleasant surprises once you board. Even though it doesn’t seem like there is much of a difference between 28 inches and 31 inches, think about it this way: what if your pants were three inches smaller? What if your shoes were just a little bit too tight? What if you had to drive with your driver’s seat three inches closer to the steering wheel? Comfort is a really big deal, especially when you’re confined to a pressurized tube for several hours. You might as well take advantage of all of the resources provided to you by Google, and use Legrooms and Google Flights together to book your next comfortable flight!